Is Earth Alliance Worth It's Weight in Elirium? 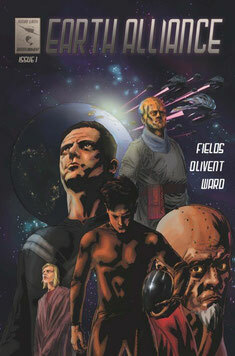 The Earth Alliance series, from Future Earth Entertainment, is set in the year 2190. This is a time when significant technological accomplishments have been achieved, space travel has been mastered, and contact with alien species has been made. The Earth's fossil fuels have been depleted, and an alien mineral called Elirium has been identified as a suitable replacement. Due to the discovery of Elirium, ten nations (G-10) that have mastered spaceflight have risen to superpower status. Humanity is not alone in its pusuit of Elirium, as an alien species named the Khutarri also covets the precious mineral. This leads to a tense relationship between the two species, which eventually comes to a head in this series, as both worlds prepare for intergalactic warfare. The story of Earth Alliance is part science fiction, part political thriller, part military adventure, part social commentary, and part family drama. There are several working parts to the story, however, writer and creator Raymond Fields does an excellent good job of seamlessly combining several popular genres into a well-developed and cohesive story. You will be introduced to some interesting characters from the alien Ambassador Katar, who diligently tries to convince his people to negotiate with the Earth Alliance, to the corporate power brokers whom seem hell-bent on leading the Earth Alliance into military conflict for personal gain. Readers are also introduced to high-ranking military leader, Admiral Ryan, and his rebellious son, Thomas, who joins the military to avoid incarceration. The characters are fleshed out and have a sense of depth to them, that is often absent in science fiction/adventure comics. The dialogue between the characters is thoughtful and engaging, giving readers great insight into individuals' motives and important story details. The artwork of Marc Olivent perfectly complements the story, and is reminiscent of the art style that graced the pages of classic science fiction comic books of the 1970's. The characters' facial expressions reflect their individual personalities, and displays the level of emotion necessary to drive key scenes. The colors by Rachel N. Ward set the tone (no pun intended) of the story and enhances the overall reader experience. From the story to the artwork, Earth Alliance is a polished piece of work, with a cinematic tone. I look forward to some drama, political scandal, plot twists, and epic sci-fi action in the future issues. If you like comic books and science fiction, the do yourself a favor and do not sleep on this one. + Well Developed Plot. Great Premise. Interesting Characters. Engaging Dialogue. Cinematic Tone. Really Good Artwork.